Money-saving deductions still remain for eligible taxpayers. Although The Tax Cuts and Jobs Act (TCJA) limited itemized deductions and doubled the standard deduction to entice more taxpayers to skip itemizing, don’t assume that the standard deduction works for you. Check all available deductions to see if itemizing pays off. 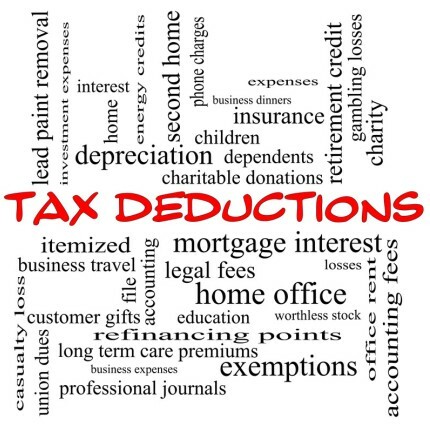 Do you qualify for any of the following nineteen deductions? This is one of the few deductions with increased limits due to TCJA. Charitable contributions are now limited to 60% of adjusted gross income (AGI), up from 50%. You can still deduct the interest on $750,000 worth of mortgage debt ($375,000 if married filing separately) for loans taken out after December 15, 2017. Deductions on older mortgages are capped at $1 million of debt. However, mortgage insurance is no longer deductible. Home equity loan interest is now only deductible for funds used for home building or improvements that meet specific criteria. Total mortgage debt, including any home equity loan, must still fall below the $750,000 criteria listed above. Qualifying medical and dental expenses may be deducted up to 7.5% of your AGI. In 2019, the limit reverts back to 10%. State and local property taxes, including income taxes, sales taxes, and property taxes, are still deductible – but they’ve been limited (see below). State and local income and sales tax deductions, along with property taxes, have been limited to a collective $10,000 by the TCJA ($5,000 if you are married and filing separately). Retirement plan contributions to tax-deferred accounts such as IRAs may be deductible. Roth IRAs are not deductible since they’re funded with post-tax dollars. You can deduct 50% of your self-employment taxes (effectively, the amount you pay as employer instead of an employee). Contributions to an HSA are tax-deductible up to $3,450 for individuals (employer plus employee) and $6,900 for families. You can deduct certain home office expenses – but only if you’re self-employed. Employees who work from home aren’t eligible. Alimony payments are still deductible for tax year 2018. For 2019, alimony payments won’t be deductible for those making payments or considered as taxable income for those receiving payments. Eligible teachers can deduct up to $250 spent out-of-pocket on classroom supplies. Bad day at the casino? You can deduct gambling losses, but only up to the amount of your winnings. Students may deduct up to $2,500 in student loan interest, although phaseouts begin at $65,000 modified AGI for single taxpayers and $135,000 for married filing jointly. The TCJA created a 20% deduction for pass-through business income from certain qualified businesses. Prior to TJCA, pass-through income was taxed at the standard rate. They’re still deductible for certain active-duty members of the military – but for the rest of us, the moving expense deduction has moved on. As long as casualty and theft losses are due to a federally declared disaster, they’re considered tax-deductible. The TJCA doubled the limit for the top estate tax rate of 40% to estates of $11.2 million or greater ($22.4 million for couples). The TCJA eliminated income limits where overall deductions phase out. Limits will return in 2026 until Congress takes action.